From my vantage point, I will miss the hat. It was, at least in this man’s opinion, a great icon that really showcased the central area of Hollywood Studios. I know that a lot of people are glad to see it go because they wanted one direct shot to see Grumman’s Chinese Theater from the main entrance, but to me, that building just isn’t big enough to stand out on it’s own like the Sorcerer Mickey hat did. Still, Disney made a decision, and what’s done is done. I may not like it, but truthfully, when I get there next month, I may realize that it looks better with it gone than it did with it there. Only time will tell. Like all things, everything has a time and place, and to Disney, the time and place for the Sorcerer Mickey hat has come and gone. What do you think? Should the hat have stayed, or are you glad to see it gone? Please participate in our poll, and let me know what you think. Thanks everyone, and have a great day! 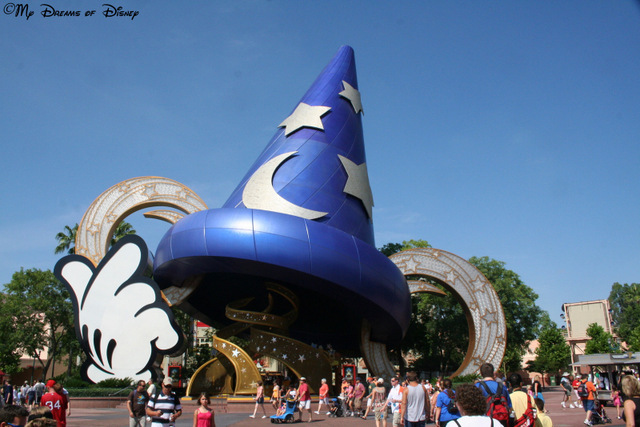 The Sorcerer Mickey’s Hat is now gone from Hollywood Studios. Do you miss it?